Melhor localização e vista (leia comentários!). 6ª Temporada para o nosso segundo andar de 1860 (EUA, primeiro andar da Europa), onde os fabricantes de chapéus locais viviam graciosamente acima de sua loja. Entrada privativa e deck com vista para o porto. Um quarto luminoso de 850 pés quadrados decorado sem desordem para fazer você se sentir em casa, imediatamente. Tectos altos, tranquilos (mesmo que bem na cidade), que lembram-lhe um tempo e lugar há muito desaparecido. Muitos convidados repetidos apreciam nosso estilo útil - mas não intrusivo, nosso foco na qualidade que importa, sem ser precioso. Privado ~ 100 convés pé sq. Estilo chique gasto com mistura de antiguidades e móveis novos. Quarto com cama de lápis cereja pós rainha. TV LED Samsung 'Smart' na sala de estar (Broadcast, Netflix (fornecido) e acesso para as suas contas para a Amazônia, Hulu e outros). Coma na cozinha com fogão básico e retro Fridge (funciona muito bem!). Grande banheira, renovado com banheira e chuveiro. Estacionamento (1 vaga), das instalações e uma curta para barcos (passeios de um dia, incluindo Monhegan), restaurantes, carrinhos, lojas, teatro da ópera e todos os que Boothbay Harbor tem para oferecer. Sólido, edifício tranquilo. Ideal para relaxamento e passeios que retornam à cidade para coquetéis e jantar. Perfeito para fogos de artifício (quando oferecidos pela cidade). Para aqueles que apreciam a tradição. Wi-Fi grátis, calor, ar condicionado, roupa de cama, e acesso a lavanderia. Acomoda 2. Podem ser alugados no mesmo edifício com Penthouse "Aerie" (500095) para viajar com os amigos! Recém-azulejos. Quarto amplo. Dois conjuntos de toalhas são fornecidas. Nós não fornecemos serviço de toalhas diária ou outras comodidades dos hotéis que custam o dobro de espaço similar. Antiguidades e arte. Clássico mas divertido. Mais 'chique' do que 'Pottery Barn. Entrada privada. Deck privado. Nota: as TVs são excelentes, mas o acesso à rede é básico. Se você está vindo de férias para assistir a algo específico sobre o plano de TV sobre a utilização do pub ou selecionar outro apartamento com cabo. We are so grateful for our expanding family of repeat customers. Each has made the work seem like pleasure - and we look forward to their return each time. 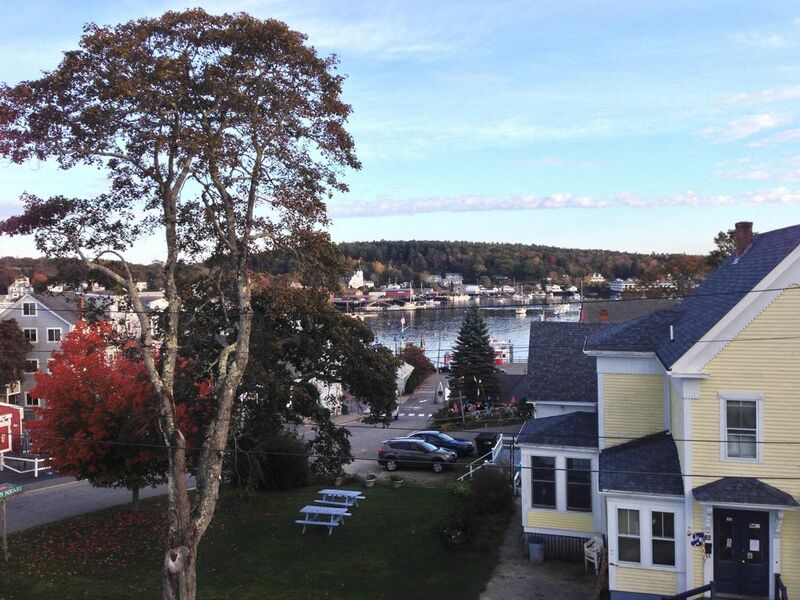 We thoroughly enjoyed our month long stay in Boothbay Harbor. This house places you right downtown where all things fun-to-do happen. It's location is the best feature -- we were literally within walking distance of everything the bay has to offer. And when we weren't participating in the activities, we enjoyed just sitting on the lovely porch, overlooking the bay, and observing all the other tourists struggle to find a parking place. The next best feature of the house is the porch. We sat for hours reading, knitting (me not him), and just people watching. Right from the porch you can see the harbor boats coming and going all day long. There's quite a bit of street noise but that just adds to the ambiance of being in the center of things. Thirdly, our apartment was clean and comfortable -- a little quirky with its 1947 Kelvinator and the European washer/dryer -- the bed was very comfortable and being from Florida we loved being able to sleep with the windows and doors open letting in the ocean breeze. Finally, our hosts (Tom and Ruthie) were a delight. Tom was very helpful and pleasant and even included us in a reception he held in the main part of the house. And, Ruthie (dog), was the greeter every time we came in the door. What a sweet dog she is -- I will miss her. We loved BH -- we walked the entire city many times and sat on the opposite side of the bay for long periods. The Farmers Market is an additional surprise with great artisan breads and treats to purchase. No doubt - if you go, you'll love it! We hope to return in the near future. Best location to walk to all that Boothbay Harbor has to offer! My wife and I stayed at 29 Mckown Street for three nights in June 2018. The location was the absolute best. From the second floor balcony, the view in the picture is exactly what you get. You are so close to the activities of the harbor yet far enough away to lose any noise or activity that might disturb you. The bed was very comfortable and the second floor unit had all that was necessary to make for a very cozy stay. All necessary utensils if you desired to make any meals, all linens, all other typical household items were supplied. This sure beats a single hotel room for comfort and the feeling of a home. We normally look for places out of town for the quietness, but this place has us rethinking that approach. It was so nice to get up, have coffee on the second floor deck, then walk off into the town to explore. After exploring, a short walk has you back at the unit with space and comfort to relax, regroup and plan more activities. We would not hestitate to come back here again. Thanks for coming. I love it in town too. I hardly saw you both - you took advantage of so much to do. We'd love to have you back and earn our 5th star!! You too, could be "sitting on the dock of the bay"
this is our second stay at 29 McKown st. So needless to say we do enjoy it. The location is great, everything is within walking distance and , Tom and his sidekick, Ruthie, are great host and "hostess". tom is always willing to suggest something fun or a great place to eat after a long day. if you are thinking of staying in Boothbay, this is a great place to be! Great location, right in the center of town, lots to do within walking distance. Comfortable rooms, and a wonderful deck with a view of the harbor, perfect for a drink or a book. And best of all,, a friendly, helpful host, always available but always discreet. Wonderful having you. Please do come back! Gail T.Where do you live? Another lovely guest who made the most of her time here and we hope to see back again. Historic resort comunidade 3 temporada com inverno solidão. Um lugar para terminar o livro que você teve na cabeceira para sempre, e descontrair em pequenos encantos da cidade. Congratulando-se com os moradores locais onde você pode vestir-se e experimentar a vida da aldeia. Rates are subject to change until reservation confirmed. Maximum occupancy 2 persons. Day guests limited to 6, no large parties. Private deck limited to 4 persons. Any rental agreement equal to or longer than 22 days requires 180 days cancellation notice for refund. We are a small operation, with an on site office usually staffed from 9-4pm week days. Check ins are requested from 4-6 pm to avoid having to revisit site (we greet all of our guests). Often we can accommodate earlier check-ins, please just ask.